"And God saw all that He had made, and behold, it was very good. (Few-leaved Hawkweed (Hieracium murorum) - 01) There are about fifty species of hawkweed in the United States. 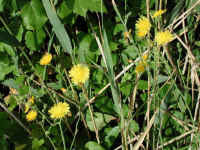 The few-leaved hawkweed is one of these. Some are native and others were naturalized from Europe. 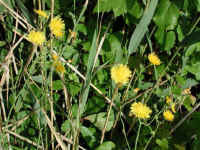 We were not able to find out whether the few-leaved hawkweed was native or European in origin. (Few-leaved Hawkweed (Hieracium murorum) - 01a) At first glance, the few-leaved hawkweed bloom and basal rosette leaves look like those of a dandelion. 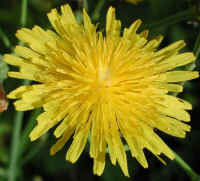 The branching stem with a single composite flower at the end of each branch points to our recognizing this wildflower as a hawkweed. 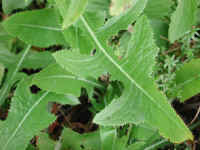 (Few-leaved Hawkweed (Hieracium murorum) - 05) This is a close up view of the dandelion-like basal rosette leaves of the few-leaved hawkweed. (Few-leaved Hawkweed (Hieracium murorum) - 02) Hawkweed are members of the Composite or Aster family, meaning that what appears to be a single flower with many petals is really a composite of many individual flowers. 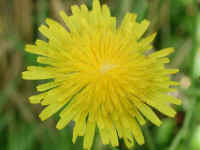 The saw-toothed ends of the ray flowers are a characteristic of the Hawkweed. The bloom of the few-leaved hawkweed has a very compact cyme or bloom. (Few-leaved Hawkweed (Hieracium murorum) - 03) Few-leaved hawkweed, as well as the other hawkweeds, have been used in herbal medicine for the treatment of inflammations and digestive problems. Perhaps the three visiting insects are there to partake of some of its healing properties! Can you spot them? 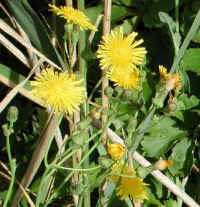 For comparison in size, the few-leaved hawkweed bloom is only about 3/4 inch across. (Few-leaved Hawkweed (Hieracium murorum) - 03a) This is one of the insects (unidentified) that is visiting this few-leaved hawkweed (previous photo at 5:30). 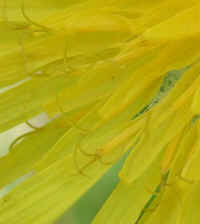 Another insect is located near the end of a ray flower at 8:00 and the third is located (partially hidden) midway between the center and the outer edge at 11:00. (Few-leaved Hawkweed (Hieracium murorum) - 04) This enlarged photo of the few-leaved hawkweed gives us a "bee's eye" view of some of the ray flowers. (Few-leaved Hawkweed (Hieracium murorum) - 04a) Because of its unusual and out of context characteristics, this is one of those photos you want to label, "What is it?" 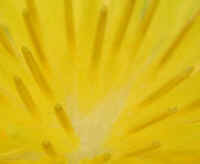 In reality it is the bright center of the few-leafed hawkweed: another creative wonder of the Lord our God.